If you’re visiting Ukraine, you likely have Kiev and Odessa high on your list of places to see. Likely, they’re the only stops you plan to make in this Eastern European nation. But to find the true heart of Ukraine, you’ll need to venture away from the Russian influence expected of most post-Soviet cities and into the western borderlands. Here you’ll find the city of Lviv, with its well-preserved town center, bustling coffeehouses and restaurants, and rich history rivaling more popular European destinations like Prague and Vienna. Lviv gives its visitors the best of both worlds, delivering cultural experiences typical of big-name Western European cities at Eastern European prices. Plus, the city is a world apart from the unrest around the nation’s Eastern border. Here are seven reasons why Lviv, Ukraine, should be your next Euro city trip. You can experience centuries-old coffeehouse traditions. Vienna gets all the credit, but the Austrian capital actually has Lviv to thank for its elegant coffeehouses. Legend has it that in 1683, Yuriy Frants Kulchytsky, a former soldier from Lviv, settled in Vienna after years of fighting. He spent time as a prisoner of war in Turkey where he learned of the magic of the coffee bean. When the Ottoman Turks came for the city of Vienna, Kulchytsky disguised himself and snuck through enemy lines to convince allied forces to rescue the city. He chose bags of coffee beans for his reward, which he roasted himself to open one of Vienna’s first coffeehouses — the Blue Bottle. But the coffeehouses in Lviv aren’t all as chic as their Viennese cousins. 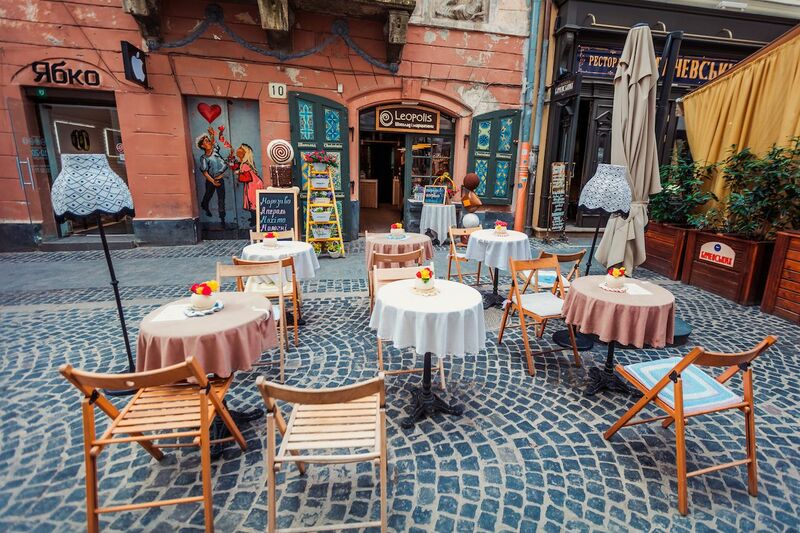 Instead, Lviv’s coffeehouses teem with warm, communal character. Aromas of ground coffee beans and steaming roasts waft about dimly lit caves of cold stone and brick flooring. Wooden tables and chairs marked with age scuffle across uneven floors. For the ultimate experience, check out Pid Synoyu Plyashkoyu (Under the Blue Bottle) for the modern tribute to Kulchystky’s original spot, or descend into darkness for a flaming cuppa at Lvivska Kopalnya Kavy (The Lviv Coffee Mine). Lviv’s coffeehouses are places for deep conversation and filling your notebook with creative prose. Look like a local and stay a while — ordering coffee to go breaks tradition! The city center is a UNESCO Heritage site bursting with beautiful architecture. A settlement has existed in Lviv since the Middle Ages, as far back as the 5th and 6th centuries. Its geographic location on the western border of an Eastern European country allowed the area to flourish economically, politically, and culturally with influences from both its Eastern neighbors and countries like Italy, Germany, and Austria. What’s amazing about modern-day Lviv is the preservation of the urban layout of old streets and squares that make up the historic center. Like rings of a tree, the city’s architecture captures its growth over the centuries. Beautiful Catholic and Armenian churches share space with synagogues and mosques while Renaissance and Baroque monasteries and residences still stand. Many of these structures are a short walk from Rynok Square, the market square with a tall town-hall tower you can climb to look down at the center. Catch the trumpets sounding from the top at 6:00 PM. 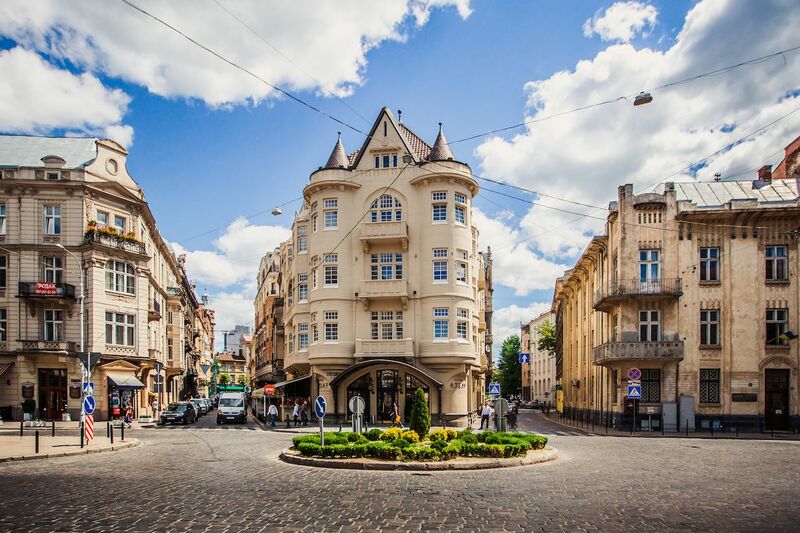 These buildings showcase Lviv’s diverse ethnic and religious past, where each group carved out small communities of the city to maintain its distinct culture with pride. But passing these structures, you also get the sense that Lviv reached such great heights politically and economically because of a level of interdependent tolerance between groups. 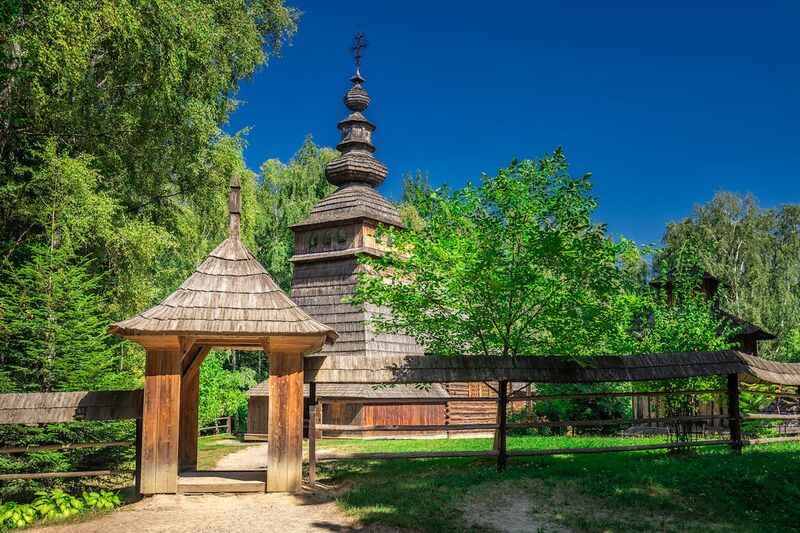 You can escape the city in one of Lviv’s lush parks. Matching the man-made history found in Lviv are its parks and public gardens, some of which have trees that have watched the city grow and change for centuries. Individual monuments in many of these spaces tell distinct stories of the city’s history. There’s Ivan Franko Park — one of Ukraine’s oldest. Ivan Franko was a Ukrainian writer, poet, and political activist (among other things) credited for writing the first detective novels and modern poetry in the Ukrainian language. The park sits on land that at different points in history belonged to a Venetian family, the Jesuit order, the Moscow army, and the Holy Roman Emperor before its redesign as a park by horticulturist Karl Bauer in 1855. A towering statue of Franko looks down on his visitors. For stunning views of the city, throw on some proper footwear and get up to High Castle Park, located on the city’s highest hill. You won’t find a castle up there anymore, but there’s a nice observation platform to catch beautiful sunsets over Lviv and the surrounding area. There’s so much more to the food than just borscht. 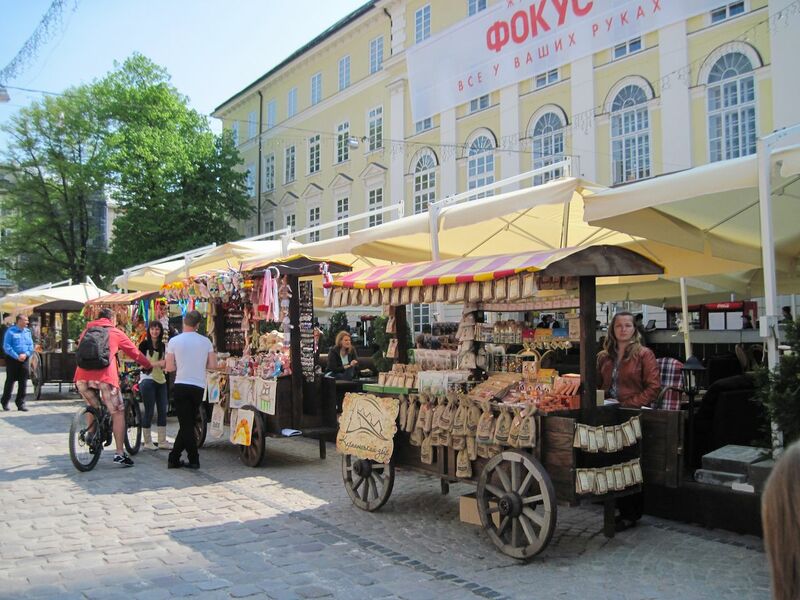 Due to its geographic location, various ethnic groups that traded and settled in Lviv brought with them distinct foods and drinks. You’ll find them served in a number of funky themed restaurants happy to share the histories of their respective cultures. Lviv manages to do themed restaurants right, avoiding the normal tackiness you’d expect by sticking to its authentic roots. Western Ukrainian cuisine provides a smorgasbord of savory options. If you’re looking for an authentic Galician gastronomic experience, throw salo (cured bacon) on some dark bread, add pickles (but don’t smother the salo! ), and pair this with a shot (or three) of horilka (Ukrainian vodka). Spirits aren’t your style? Wash down kruchenyky (stuffed meat rolls) and kovbasa (sausage) with one of the tasty local beers. If you’re vegetarian, Lviv has you covered with countless starchy dishes like its own version of borscht (cabbage and beetroot soup to which they add sour cream and garlic-covered buns) or holubsti (stuffed cabbage rolls). 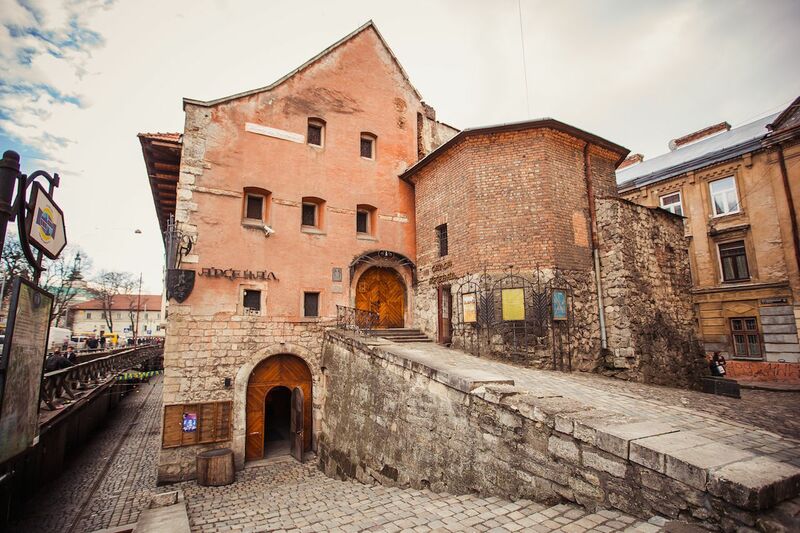 You’ll learn about Lviv’s proud Jewish past and World War II history. Most World War II buffs jet off to Berlin, Poland, or even Amsterdam for a look at some of the memorials to those who suffered atrocities under the Nazi regime. But Lviv has its own Jewish past as Jews played a significant role in the synergistic relationship between ethnic and religious groups that makes this city UNESCO-worthy. You can see the Holocaust Memorial in the city center and venture out for other significant stops. 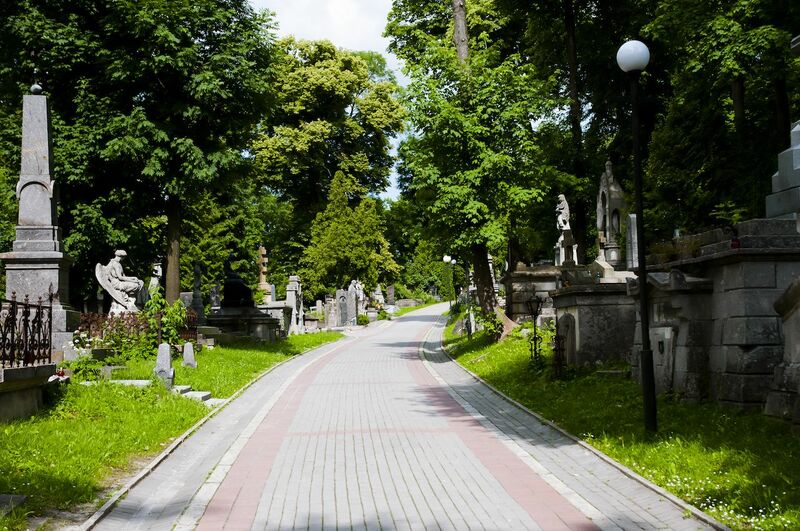 To the northwest of Lviv center lies Yanivsky Cemetery, where a large number of Jews lie buried in their own section beneath headstones inscribed in Hebrew. Further down the road towards Poland, you’ll find the most haunting site — a plaque marking the location of the Janowska concentration camp, where Nazis murdered most of Lviv’s Jewish population. The arts and museum scenes are on point. Catch a performance at the Lviv Theater of Opera and Ballet without breaking the bank. As with most of the historic Old City, this beautiful building has withstood the test of time since its construction in the late-19th century, and while constructed on a former marsh, it’s no longer sinking. Inside, sculptures and paintings line the halls. Shows often take place on weekends, and you can purchase tickets to operas, ballets, and comedies online or right at the venue. There are over 50 festivals each year. 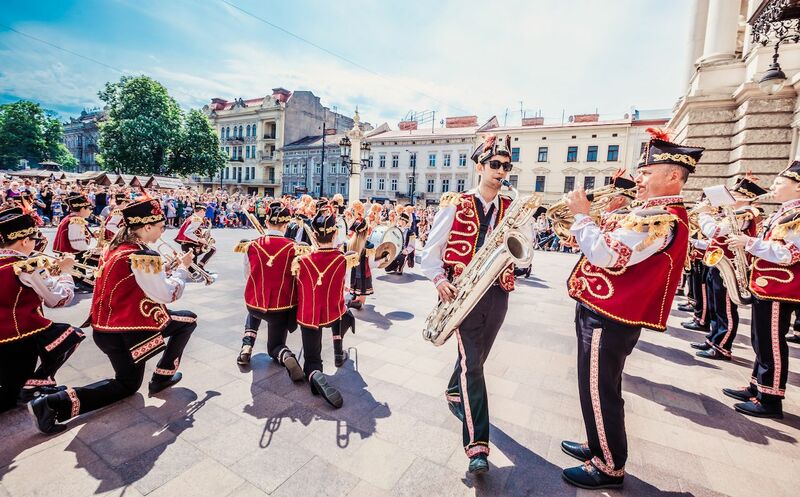 Lviv marks itself as the heart of Ukrainian culture with over 50 festivals each year celebrating everything from art and film to beer and doughnuts. No matter when you arrive, your visit is sure to line up with an event. Decorate Easter eggs throughout April during the Pysanky Festival or dance in the streets with locals during one of the summer jazz (Leopolis Jazz Fest) or folk music (Festival Etnovyr) festivals. For a real taste of Ukrainian pride, make sure you’re there August 24th to celebrate Ukrainian Independence Day. And if you make it for Independence Day, you might as well stick around until the end of September when Lvivites pay homage to their favorite caffeinated beverage: coffee.